Since January MJ has been living in Santa Clara and I have been living in Sacramento. That's distance of roughly 2 hours (depending on how fast you drive, it could be 1.5 hours, which it usually is for me) which has caused some changes in our living conditions considering that we were living together for almost the last two and a half years. I had to stay in Sacramento so I could finish my last semester of school and he had to move to Santa Clara for a major promotion at work (I am very proud of him, he's an awesome manager and overall business genius) and rather than renting two apartments, he moved to SC with all of our things and I moved in with my mom, back into my room that I had as a teenager. While I've been at my mom's house, she makes most of my meals (she's been referring to me as Oprah lately, LOL) and then on the weekends, when MJ and I are in Santa Clara, we pretty much totally veg because the week seems very long with the extra driving and both us missing each other a ton. Long story short, I eat healthy and am totally good on my diet Monday - Thursday and then when MJ and I are together again, I basically eat like a man. Well a man exploring new restaurants in a new town. For example, I had a Double Double from In-n-Out Burger at 11:00 this morning. If MJ and I were living together like normal, he probably would have made us a cute little Sunday morning breakfast because I would have gone to the farmer's market like I used to/normally do on Sunday mornings. Instead, there were no groceries in our house and on our way to McDonald's we spotted In-n-Out, enter the Double Double, fries and diet coke. So basically I'm postponing this whole Wedding Dress Diet thing until July when we will be living together and have some normalcy in our lives once again. The upside: I won't stress on the weekends about what we're eating, instead I'll just enjoy the new restaurants, food and spending our little weekends together; plus I can continue to be good during the week (and maybe add some extra cardio to make up for my weekends a little bit). The downside: this will give me less time to get in shape before our engagement photo shoot in August (and our engagement party in August). Has anyone else tried to lose 15 - 20 pounds in a short amount of time and had success? What did you do that brought you success? Therefore, I'm enlisting myself into Bridal Bootcamp, which will basically consist of me kicking the crap out of myself at the gym and actually exercising some self control (poo!). I Googled bridal diet and found an overwhelming amount of information for and about brides who want to lose weight fast. Even this: http://www.msnbc.msn.com/id/8632379/ the MSNBC Bridal Diet Challenge. Personally I am just going to use the South Beach Diet method. I read the book last year (around September/October) and lost 13 pounds and felt great, but then the holidays came around and I'm right back at where I started. Damn holiday sugar cookies, and wine, and candy, and... Anyway, I'm going back to good fats, and good carbs only and basically no sugar for two weeks (including no bread and that's pretty much what is pumping through my veins at any given time). The engagement pictures are something that I'm going to hold on to forever and pass along in our Save The Dates to all of our family and friends, so I want to make sure that they see me when I'm feeling my healthiest and happiest (I'm already at the happy point, time to get that healthy part down) because I think it will really show through in our pictures. And when I'm all old and wrinkly and MJ looks at me, I can show him our engagement pictures and remind him why he wanted to marry me in the first place. :) Plus, I've noticed, that we hardly ever let people take pictures of us and I think it's because we both need to lose 20-30 pounds. No sugar, and daily running will get me in engagement picture shape in no time. I just emailed our deposit and catering agreement form to the events coordinator at our #1 reception site. Hopefully he can read the scanned form and will email me back tomorrow to let me know the date and time slot is ours! Something will have to be done about the chairs, but that can hold off for now. It will be a pretty huge relief to know that the two of the biggest "to do" items are completed already. Then it will be time to move on to details (or ya know, moving on to items such as finding a place to live when our lease is up in July, or finding a job where I can make good money now that I'm a college graduate) and take a bit of a breather from some of the wedding planning. We sort of skipped over some of the inital fun to dos including sending out annoucnements or actually letting all of our friends and family know that we're getting married. None of MJ's siblings (minus his sis) have seen the ring, or even us for that matter since we've been engaged. Seems like there is an engagement party to be planned, engagement photos to be taken (they don't need to be over the top), and annoucements to be mailed out to those nearest and dearest to us. This one is cute, only I want some color in it. Only black and white feels too severe for a Spring wedding, especially in Carmel, even if it is in the evening. A few days ago I was looking online for announcement ideas and I saw a really cute save the date with photobooth looking pics, and the bottom simply said Save the Date and the date of the wedding. I think we'll end up doing something similar, especially if we're going to be doing a black and white theme. Which the more I think about it, the more appealing it's becoming. Black and white and an accent color (I'm not sure if green is that color but I'm having a hard time letting go of green in our wedding, hmm) but I don't want it to be pink, I'm tossing green around, and really what else is there that can hold its own against black and white? I guess it's back to Google Images for me. How did you come up with the color scheme for your wedding? Was it an easy decision for you? This is what I'm thinking for our colors, as it were. The only problem that I have now is that I want to let my MOH & BMs wear these really cute little black dresses. But when I think green and black...all I think about is the Wicked Witch of the West. 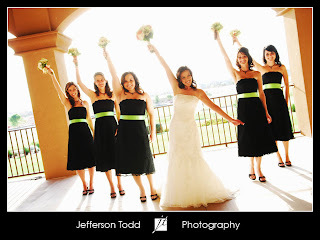 :( So I really like the green and white details by Martha, but I also really like the LBDs for the MOH & BMs. I think I'm back at square one as far as wedding colors/theme goes. Even though we're getting married in Carmel, I don't necessarily want to do a beach theme, in part because we're not getting married out on the beach (the ceremony & reception are indoors) but it also feels a little cheesy. I have started to look at dresses and have found one (so far) that I'm in love with. I'm hoping that finding a dress or at least dress style that I really like will help me find a direction to go in with the style of the wedding. 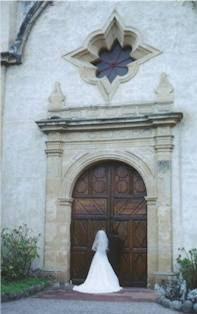 My MOH told me yesterday that two Irish looking people getting married in a Catholic Mission with a green reception felt like almost too much Irish, and I kind of agree with her (she also suggested that since we wanted to get married in May of next year that we think about Memorial Day weekend and we ended up taking her advice on that one :) ). What colors/theme are you using for your wedding and how did you decide on it? 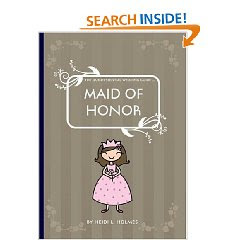 This looks like a cute book when you preview the chapters; the last chapter is about Toasting (which is something that MJ and I were joking about the other night and the MOH and I were joking about yesterday), I think it will be cute and hopefully offer some insite and guidelines. 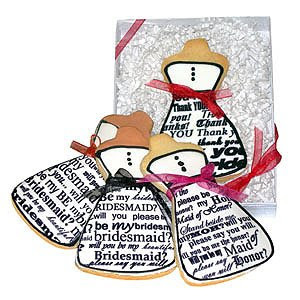 Labels: Will you be my Bridesmaid? P.S. Great news!!! On Friday we got the estimate back for the La Playa Hotel reception and cocktail hour and it's actually below what we were budgeting! I was screaming in my car when the email came through. 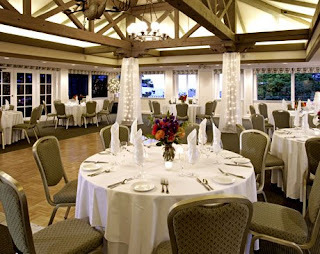 We're getting both of our first choice venues for the wedding! Now I only need to get my mom to put the deposit down for La Playa to make everything official. We've booked a location! It's official! 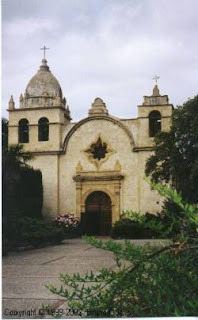 So on Tuesday Mike and I (with some help from the FILs) booked the Carmel Mission to exchange our wedding vows. I was beyond giddy when Liz told me that she'd pencil us in for the time slot. Immediately I called Mike to tell him all of the good news and ask questions (apparently we need a permission form to get married there...kind of confusing but we've got it all figured out now). We're both thrilled that we were able to book the Mission for Memorial Day weekend! 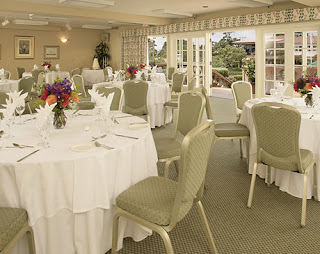 Next up - booking the reception venue. We're waiting to get a quote back from our first pick, La Playa Hotel. Our #2 pick emailed her quote earlier this week. Oh Em Gee...I just about died laughing when I saw the final estimate price. It was about $8,000 over what we wanted to spend. Don't get me wrong, the location was gorgeous but there was no lodging on site, you could only use their wines (it's a winery), no liquor is allowed, and you could only use their caterer even though he doesn't work for the winery. Mostly we were concerned about having to shuttle folks to a hotel after the reception and maybe after the ceremony too. The Mission is less than a mile from the La Playa and the La Playa is uber close to other lodging options. Now it's just a matter of waiting to receive the quote and then putting our deposit down on the place. I'm crossing my fingers that the reception isn't too far out of our budget. Please, God, don't let the estimate say more than $15k. We're engaged, let the craziness begin! MJ: "Babe, if I wanted to look at all the pictures of us where would I find them at?" Me: "They're on my laptop, you can look at them this weekend..."
MJ: "That's the only place that you have them?" Me: "I don't know, how come you want to look at pictures so bad." MJ: "Just cause, is your laptop the only place they're saved?" Me: "No you can go to www.kodakgallery.com/myname and get them from there too." MJ: "Awesome. Thanks. Love you. Bye." Then I thought for a few seconds about how weird that exchange was and went back to work. Then on Thursday before finals for my last semester of college, Mike came from home to work to his girlfriend who had hair back, PJs and no make-up on only to present me with a sweet little photo album that he made of Us. The sweetest thing ever. So there we are on the couch, just flipping through pictures of the last 5 years, Halloween, Thanksgiving, Christmas, New Years (of course I kept trying to rearrange the pictures into chronological order) then the very last picture is one I've never seen before. A picture of a diamond ring. Me: "Um, babe. I think you have someone else's picture." MJ suddenly down on one knee: "I've loved you since I met you, and I want to spend the rest of my life loving you. Will you marry me?" Me: "AHHHHH...wait, I don't have makeup on! Oh my God! Of course! Yes! Oh my God! Yes! Yes! Yes!" I must have thought about the day he would propose and fantasized a million and one ways how he would do it and where. Never ever did imagine anything so sweet. To top it off he totally threw me off by proposing on a Thursday night! Sneaky! I love it!! !